How is the CCAT Test Scored? The Canadian Cognitive Abilities Test (CCAT) is a reasoning assessment used to determine a student’s eligibility for admissions into gifted and talented programs. It is a group-administered intelligence test given in Canada to students in grades K-12. The CCAT 7 measures verbal, nonverbal, and quantitative reasoning. The test is given over three separate sessions and takes 90 minutes in total to administer. The CCAT 7 is a group administered assessment completed with paper and pencil. Students fill in answer sheets or test booklets depending on the level of test they are completing. The CCAT 7 covers questions related to three sets of abilities. For examples of these types of questions, start practicing with our 100 free questions. Verbal – The verbal section assesses a student’s understanding of the structure of language and relationships between words. It measures the ability to use language for reasoning tasks. Quantitative – The quantitative area measures the student’s abilities for reasoning and problem solving using numbers and mathematical concepts. Non-Verbal – Questions in the nonverbal section contain diagrams and pictures. This section assesses a student’s ability to reason and problem solve independent of language. Verbal Classification is designed to test your child’s conceptual thinking skills. Verbal Classification questions tend to be some of the hardest questions on this test. Verbal Analogies are designed to test your child’s ability to make concrete connections between objects and concepts. Analogies presented in this form are designed to explore your child’s vocabulary and understanding of language. What is the Quantitative Section? The quantitative area measures the student’s abilities for reasoning and problem solving using numbers and mathematical concepts. What is the Non-Verbal Section? Questions in the nonverbal section contain diagrams and pictures. This section assesses a student’s ability to reason and problem solve independent of language. Figure Classification is one of the most intuitive sections on the CCAT 7 test, which is good news for you and your child! Figure Classification requires your child to examine a set of figures and attempt to understand the rules at play, and to be able to group the images according to these rules. What is a Figure Matrix question? A Figure Matrix question gives your child a series of figures that progress or otherwise fits together in a certain way. One of the spaces is left blank. Your child’s job is to figure out which figure fits into the blank spot so that the series makes sense as a whole. Figure Matrices are most often expressed in two ways. The first is in a “sentence” format, as with the first two matrix question on the right side. The CCAT 7 is a written “fill in the bubble” test, with multiple choice questions. 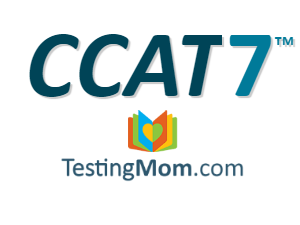 The CCAT 7 test includes a number of sub-tests that are given to kids in varying age groups. Even though the CCAT 7 test is used to screen for gifted and talented programs, that doesn’t mean that you can’t (or shouldn’t) prepare. In fact, the high stakes of this test make it that much more important that you ensure your child is fully ready when they walk into the testing room. CCAT 7 was developed through trials and use with over 50,000 Canadian students, and normed on over 40,000 Canadian students in Grades K–12 to ensure reliability of results. It was also co-normed with the Canadian Tests of Basic Skills (CTBS) to allow for accurate comparison of achievement and ability levels. Hi, can you please tell me how many questions in each section for CCAT test? How many questions kids need to finish in 10 minutes. How do you get the question page. Canadian Cognitive Abilities Test™ (CCAT™) is a trademark of Nelson Education, or its affiliate(s), or its licensors. TestingMom.com is not affiliated with nor related to Nelson Education or its affiliates (“Nelson Education”). Nelson Education does not sponsor or endorse any TestingMom.com product, nor have TestingMom.com products or services been reviewed, certified, or approved by Nelson Education. Trademarks referring to specific test providers are used by TestingMom.com for nominative purposes only and such trademarks are solely the property of their respective owners.